by admin | September 15, 2011 | Misc. Heathers Cakes is a cake designer in Edinburgh. Heather has been designing and creating bespoke cakes since she found a passion for it in 2009. 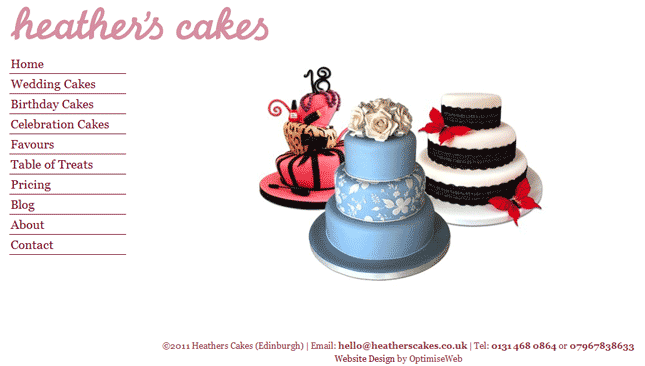 Heather was making so many cakes that she wanted to create a website where she could show-case them to potential customers around Edinburgh. Also, since she had actually established a business from just doing it for fun, she also wanted her website to be found in the local community to get more business leads. As a cake company, Heather’s cakes visual presence needed to look creative but also professional without being too cluttered. The new site was custom designed with appropriate place of pictures and the home page show-casing simple and elegant cakes. From scratch we created a template wordpress design which was suitable to her business model. The new website aimed to give potential cake customers a comprehensive but friendly browser experience to Heather’s cake expertise, as well as showcasing her very tasty cakes and design styles. Heather can easily add new products herself through the simple yet powerful wordpress content management system.